Up From the Top: Life in a tunnel, I see the light and a bit'o the green. Life in a tunnel, I see the light and a bit'o the green. This week is almost gone already and it seems as though nothing has happened. It has really been pretty much a week filled with routine mundane stuff. Much needed grocery shopping, some other quick shopping trips, household repairs and choirs, etc. It has been raining a lot and we are in another cold snap so I have been pretty much cooped up inside. There has been little or no local letterboxing activity. Frankly It has been very boring, as if I have been cut off. Really it has been more like going through a dark tunnel, but I think that I can see the light ahead. A new smoker arrived to replace the one we have been using for many years, but it has been too cold out to finish assembling it and trying it out. My wife says it is a Cadillac but it is more like going from the Chevy that I was using to a Buick. She should see some of those "Cadillacs", this is nowhere close in features or price. It has an electronic thermostat, is insulated so it can be used in cold weather, and uses far less wood. It will go for hours and hours without being checked on all of the time. In the past our smoker has been used for smoking turkeys several times a year. Donna has developed a fondness for Barbecue. Now REAL Barbecue (not just grilling then smearing it with sauce) of an assortment of slow cooked smoked foods will be added to the repertoire prepared in it. The schedule today calls for starting on a big pot of Chili to be shared Sunday at our church's Chili cook off. I will use the same basic recipe that we tried and loved at home a few weeks ago. The turkey that I smoked recently is all gone so I also need to throw the carcass into a pot to start soup. If there is any chili left, that along with turkey soup, and a left over pork and rice casserole should just about take care of next weeks meal needs. Of course baking scones for Donna to share at work on St. Patrick's day is on my calender for Monday, and then on Tuesday I will fix an real Irish dinner. The weather guru's say that it will warm up over the weekend so next week has lots of promise. Celtic pagans (Druids) revered the shamrock for its triad leaf formation, as three was a mystical number in their religion. 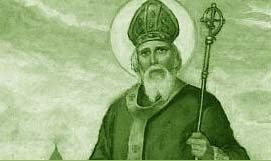 In the 5th century, Saint Patrick is said to have used the shamrock to teach the doctrine of the Holy Trinity to the Irish pagans. With the three leaves representing the father, the son, and the holy spirit. During the 19th century Irish rebellion against England, wearing the shamrock took on political significance. 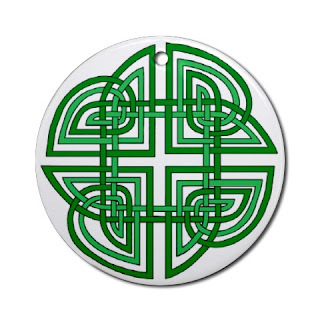 Seen as a symbol of Irish pride, British law made wearing it punishable by death. It was during this period that the term "wearin' o the green" came into use. Still today, displaying a shamrock and wearing green are considered expressions of Irish identification. Of course, they are no longer criminal offenses. 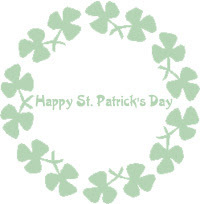 Especially on St. Patrick's Day, when everyone - Irish or not - will be showing off their green pride. As the saying goes, "Everyone wants to be Irish on St. Patrick's Day." I wonder if I am the only one who remembers when you would be likely to get pinched if you were not wearing green on St. Patrick's day?